This is the title to one of Max Lucado’s newest books. I’m really excited about this book. 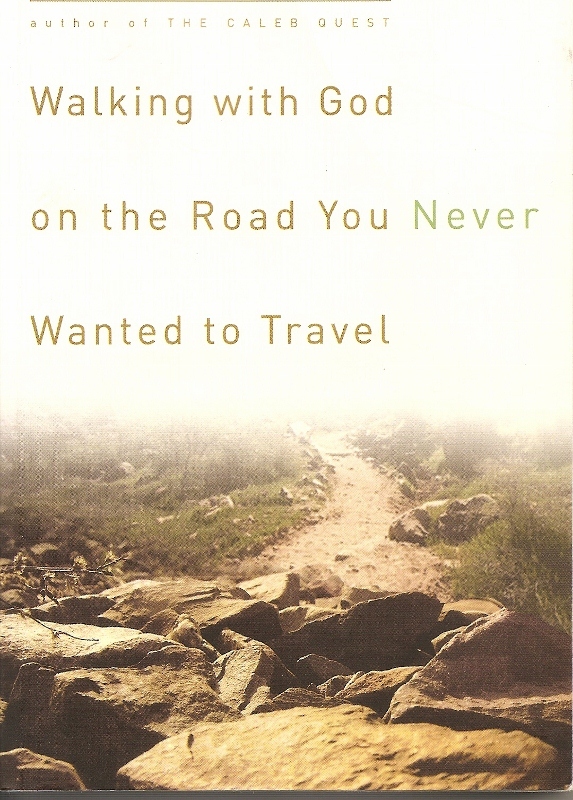 As many of you know, all through 2011, I wrote articles on a book called “Walking With God on the Road You Never Wanted to Travel” by Mark Atteberry (click here to access this series). That book has had such a positive impact in my life seeing as I have been living with my muscle disease for four years now. Reading Atteberry’s book gave me the hope and encouragement I needed to be able to walk along this difficult path. As we came to November last year, I could see that we were nearing the end of writing articles on that book. I wondered what new book I could start to write articles about that met me where I was at in life, plus would be an encouraging book for all of my readers. My wife was the first one to mention Max Lucado’s new book to me. I went online to check it out and immediately I felt a connection to it. Even by just reading the Introduction of the book, I felt certain that this would be an excellent book to read and to write about. Then suddenly in 2008, my muscle disease hit me like a freight train that stopped me dead in my tracks. I had just returned from a very active translation consultant project in Papua New Guinea. Days after getting back to Canada, a few troubling aches and pains flared up over the following six weeks to the point that I was barely able to walk across my living room floor. Needless to say, the following months, which turned into years, were filled with pain, fatigue, frustration, discouragement and even depression. The turning point came when I participated in a six-week small-group study on learning how to deal with chronic pain. It was at that group that I was introduced to Atteberry’s book. And those two things helped me so much to pull out of my deep despair. Lately, I really believe that I have learned how to manage myself well physically by adapting my environment and staying within good boundaries. And I’m also doing quite well emotionally and spiritually. I believe I have for the most part, come out of my wilderness experience and am much more ready to start figuring out how my life will look in the future. I am at the place where I want to see how my life and my illness fit into God’s grand scheme of things. We need to know where we came from. Knowing connects us, links us, bonds us to something greater than we are. Knowing reminds us that we aren’t floating on isolated ponds but on a grand River. 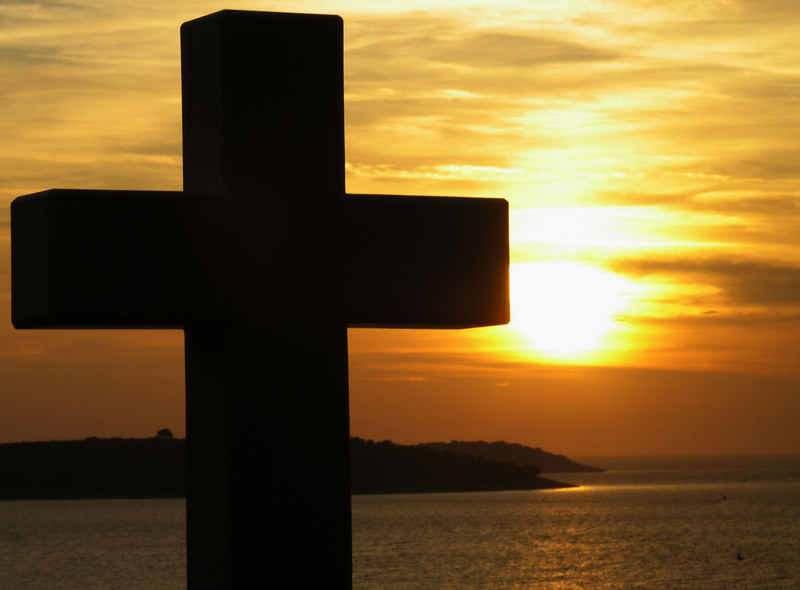 It is well-known that Lucado is one of today’s most popular Christian authors. In 25 years of writing, he has authored more than sixty books and other various print items. I think what makes him such a good author is how he can creatively weave the story in a simple and humorous manner. But within each story lies a deeper story. And so what makes us laugh and cry from what he writes often softens us and prepares us to hear the deeper spiritual truths he wants us to really hear. Can you find the plot of a book in one paragraph or hear the flow of a symphony in one measure? Can you uncover the plot of your life by examining your life? By no means. You are so much more than a few days between the womb and the tomb. 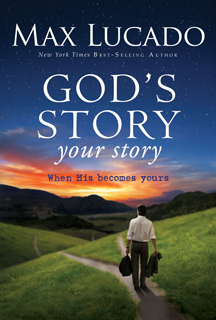 Your story indwells God’s. This is the great promise of the Bible and the hope of this book. My hope is that I will do a good job this year as I write an article every second Saturday. And I hope you will enjoy what I write, but also that my articles will help deepen your faith in God. I look forward to the year that lies ahead of us. [God’s Story, Your Story] Max Lucado. Copyright [Thomas Nelson Publishers, 2011] Used by permission. It has been said that there is nothing more powerful that a personal testimony concerning something extraordinary that has happened to a very ordinary person. This is the last article I will write on the book written by Mark Atteberry, “Walking With God on the Road You Never Wanted to Travel“. We tend to put so many others up on pedestals, like sports heroes, movie stars, gifted speakers, etc. So many of us feel like we have very little to offer to other people. But the Scripture I quoted at the top of this article says otherwise. I think it would be fair to say that every person who has ever lived has encountered difficulties and painful experiences. That is simply part of being human. What is also true for those who believe in God is that many of us can tell stories about how God came through for us and brought us through those difficult moments. And it is these stories, these testimonies, that Atteberry says we all need to share with those who are around us. Rephrasing the Scripture above, God is a God of great compassion who helps us in our times of greatest need, and that often, He allows these difficult times to come in order that we can then in turn help others who are now going through what we just came through. The big thing to remember is that your testimony is simply your story. It doesn’t have to be a sermon. It doesn’t have to be theological. It doesn’t have to answer all the difficult questions people might feel inclined to ask. All it has to do is show how the Lord helped you as you walked with Him along your hard road. It has been just a little more than a year ago when I started writing articles on this blog site. I had the choice at the beginning to use my site as a venue by which I could whine and complain about all the pain I suffer with my muscle disease, and how hard life is for me. I could view my world as having shrunk down to sitting in my sofa recliner day after day within the confines of my living room and apartment. But God challenged me to view my struggles as an opportunity to reach out to other hurting people. Very quickly I saw that by means of my internet connection, I could potentially reach thousands of people with my stories of what God has done in my life in the past, and is still doing through me today as I take one day at a time by faith. In fact, as you look at the visitor counter, you can see that there really have been thousands of people who find it worthwhile to visit and read the articles that I write. But as soon as I say that, I have to figuratively knock myself on the side of the head and remind myself that I am not writing for the thousands, I am writing for the one person who really needed to hear the word of encouragement that I offer in a given article. The best way to measure the value of a testimony is not by the size of its audience, but by the impact it has on the people who hear it. If your story helps even one person stay faithful to the Lord — or perhaps return to the Lord — then it has had an eternal impact. And this is where we conclude our study of this book. I really hope though that these “Hard-Road Journey” articles have been more than just a book study. I pray that we have been able to walk along side of each other and be encouraged in our faith and walk with the Lord because we’ve gone on this journey together. I am amazed and thrilled that God has used me in this last year to impact others. All I’ve done though is to be open and honest and share “my story”. Even if you never go public like I have, I’m going to promise you that if you are open and honest with others around you, then God will use “your story” to also be a blessing to someone else who really needed to hear what you have to say. May God bless you as you do this for Him. We have come to the last chapter in our book that we have studied together this year on The Listening Post. The title as many of you know is “Walking With God on the Road You Never Wanted to Travel” by Mark Atteberry. We have journeyed together with the children of Israel through their wilderness wanderings until they came to their Promised Land. But we have also journeyed together with reflections on life with one another and seen that the God who fulfilled His promises to the Israelites is the same God who fulfills His promises to us in our lives. This book has had such a profound impact on my life as I have been on my own personal hard road journey living with my muscle disease that flared up 3 ½ years ago. There have been many difficult days for me along this road. Even today, I am not feeling well as I have not had a good sleep and battled pain and fatigue for four days now. But then I remember that my commitment to God is to serve Him, not complain to Him. And I also remember that God’s promise is that when I am weak, He is strong. And reflecting on that brought an old hymn below to my mind. Before I gave my life to Christ at age 12, I was only concerned about Me. (But isn’t this the attitude of all children?) Yet I wonder what kind of adult I would have turned into if Christ had not become my Lord. I shudder to think about how self-focused and self-serving I would have become. So I praise God that I heard the Gospel message when I was young and responded to that call. And it was only a few years after making that decision to make Jesus my Lord that He showed me that my life was to be fully dedicated to serving Him in mission work around the world. I have never thought of my years of service for Him to be my “duty” or my “repayment” for the salvation He offered me. Rather, it has always been my joy and privilege to offer my life as a thanks offering back to Him. As I consider the years that I have been in ministry and mission work up until my disease become evident, I feel that my commitment to serve Christ was in some ways easy for me. Like the first three verses of this hymn mention, I gladly gave Him what was not difficult to give. I would go, I would reach out, I would sing for Jesus. And I would enjoy myself as I went along on this adventure in life. But it in these past 3 ½ years, I have found that serving the Lord had to become a regular choice, as I could choose to give in to the disease and decide the effort to go half way around the world to do our mission work was not worth it. Even more basic than that, I had to choose to praise God and thank Him for each day that I woke up, no matter whether I “felt” good at the start of the day or not. Living for Christ is giving all of me over to Him, my mind, my will and my heart. I found that my world shrunk for me all the way down to little more than my living room. With little to do, and little ability to do much more than sit in my recliner chair and become even more attached to my computer, I could have literally turned into a “couch potato”. But God was not finished with me yet. Through encouragement from my wife and others, we found ways for me to still serve God, even sitting in my own living room. Through modern technology, I am still able to work on translation projects that are on the other side of the world. With modern medicine to manage the pain, and rapid transport to get me to other countries, I set myself up in a different recliner and keep on being active in this mission ministry. But God also opened up this ministry of blogging so that I could encourage others to believe that if God can use me and bless me as He has in spite of my limitations, then He can do this for anyone. Back to Atteberry and his last chapter, he tells us that when we have broken through from the barren wilderness of our hard road experience, we need to set up a memorial, as a testimony to others that God is faithful and will carry us through. And I believe that is what this blog site has become for me. I sit down and write three articles a week and memorialize all the good things that God has done for me and is still doing for me. My prayer is that my writings, my memorial stones, have brought honor to God, and been an encouragement to all my readers. In our last article on this topic of “Follow Where God Leads“, our author, Mark Atteberry, advised us to think and pray through the opportunities that present themselves to us. If we have been wrestling through a difficult period in our lives, and then an amazing answer to our problems shows up, we still need to read God’s Word, pray to receive peace from the Holy Spirit, and listen to the advice of godly people to be sure this is what we should do next. Now if the answer is “Yes”, then by all means, go forward and enter into the blessings that God has put in front of you. It is at this point that we must exercise both faith and courage to believe that this “present” is from God. Unfortunately, some people can become paralyzed at this crossroad and not move forward. Either the person believes that the gift is too good to be true, or they believe that they are not worthy of the gift, and they decide to punish themselves for some reason and don’t take the gift that God is offering. On the other hand, the very opposite can happen for some people when they see what looks like their “promised land” flowing with rich opportunities and bright futures. A person can be so captivated by the wonder of what lies ahead, that he or she throws caution to the wind and dives into the new experience without taking any precautions against heartaches or disappointments. Then we were approached with the idea that we could go over to one of our Branches in Africa and help out. Great! Wonderful! An opportunity to return to the mission field. Now I would be helping out in the administration of the Branch, instead of doing translation work. And Jill would be doing a lot of work in the Finance Office, instead of being involved in literacy or Scripture Impact or home schooling our high school boys. But hey, we would be back in mission work. Perhaps one of the greatest oversights I made was to think that we could recapture what we had as a family living in Papua New Guinea. But living in an African city of a 1/4 million people, with nationals paid to be your house guards, and thinking we could learn Swahili in just a few weeks, was nothing like living in a small, rural PNG village where we at least knew the trade language. All of this and more led to great disappointments and pain instead of the Mission Paradise we had expected. But does that mean that because we had a terrible experience when we tried to return to a life overseas that we should just forget about ever trying again? Not at all. Atteberry himself gives us one more important piece of advice when we are emerging out of our wilderness experience and are on the edge of entering into a new “Promised Land” experience. Atteberry says we are still to be characterized as people of hope. It doesn’t really matter if we have had one, or two, or a hundred bad experiences in the past. We know from Scripture that God is a God of love, and that He is a giver of all good things. Just as God went before the Israelites as a cloud of smoke by day and a pillar of light by night to lead them all the way to their promised land, so God will go before us and lead us too into a better life. Now does that mean that things will suddenly get better for you tomorrow, or next week, or next year? I don’t know what God has in store for you. But even if it is not fully realized in this life that our troubles and trials will be overcome, we do know that in our life to come with Christ in eternity that we will see the end of every hardship and heartache. What, then, shall we say in response to these things? If God is for us, who can be against us? …. No, in all these things we are more than conquerors through him who loved us. For I am convinced that neither death nor life, neither angels nor demons, neither the present nor the future, nor any powers, neither height nor depth, nor anything else in all creation, will be able to separate us from the love of God that is in Christ Jesus our Lord. So here we are, ten months later, and still talking about walking through difficult wilderness experiences. We have been following the story of the nation of Israel as they walked through the desert for 40 years and learned from their experiences as highlighted and taught by Mark Atteberry in his book, “Walking With God on the Road You Never Wanted to Travel“. Can you imagine what it would have been like to be one of the Israelite children growing up and wandering around in the desert for 40 years? Now I’m sure that they would have camped out in some spots for long stretches of time, and had found some oases to enjoy along the way. (Read the article on “Oases“.) But it must have been nearly unbearable to hear the stories of how they failed as a nation to enter the Promised Land once, and were still yearning for the next opportunity to come. And then suddenly, 77 chapters later (from Exodus 13 to Numbers 33) and 40 years after they had left Egypt, they finally camped beside the River Jordan and were able to see across to the other side where God was leading them, the Promised Land of Canaan. 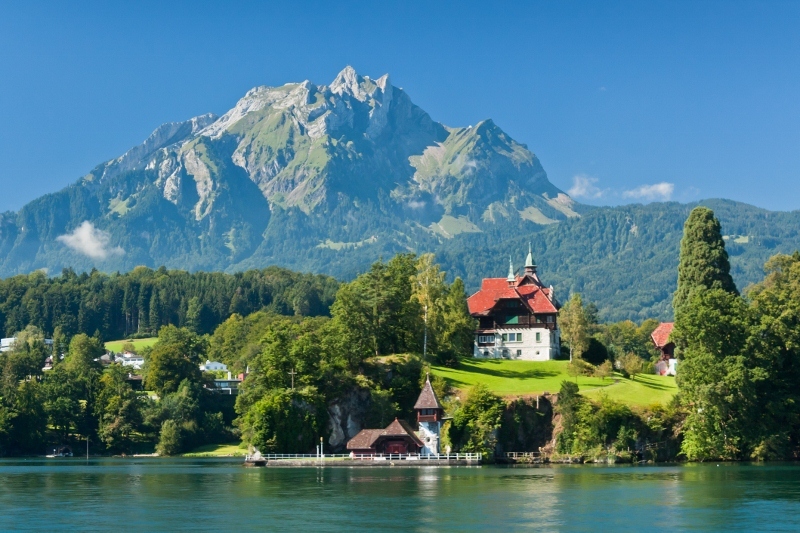 A land that was said to be “flowing in milk and honey”. But one that also still contained great walled cities and those nasty giants (over 7 ft tall) called the Anakites. And this became the great moment of decision once again for the Israelite people. Did they dare to believe that this was the moment they had all been waiting for. Just like the lyrics up above, the people had been rehearsing for 40 years to be ready to answer to God when He called on them to act in faith, to follow Him, and to take the precious gift of that abundant land that He had always promised He would give them. I believe what can so easily happen to us is that we look back on the previous disappointments and disasters of our lives which resulted in such emotional and psychological pain that we are too afraid to even try to improve our lives. And Atteberry recognizes this as he does not suggest that we just run forward and throw caution to the wind to grasp at what could be a better life. Rather, he does suggest that we exercise some wisdom and discretion, even as we push forward to leave our desert experience and follow God into whatever new and wonderful experience He may have in store for us. In fact, when something looks almost too good to be true, that just might be the case. But then again, maybe not. Question 1: Having studied, what is my Bible telling me? Question 2: Having prayed, what is the Spirit telling me? Question 3: Having listened, what are my friends telling me? These are excellent questions to ask when trying to determine God’s will for you in any given moment when you need to make a decision. We first need to determine if this “better life” that we are pursuing after is in any way going to compromise or hinder our relationship with God. Then we need to allow time for God’s Spirit to speak to our spirit about this, and confirmation of a good decision should always be accompanied by the inner peace that only God can give. Finally, since we do not live in a vacuum, or on an island as they would say, we should always try to consult others who may be affected by this decision. And seeking out wise advice from godly people will often help us to gain a perspective that we may not have had otherwise. But then it ultimately comes down to us. At the end of the day, we will need to make a decision. And if we have followed through on Atteberry’s three questions and found the answer is yes, then we need to boldly go forward into whatever lies ahead. Now Atteberry has two more key thoughts to consider as we go forward, and they will be the body of my next article. I’ll see you then. In Part 1 of this two-part article, I shared some details about the struggles and disappointments each of us within my family has had in these past three years to experience the fulfillment of our personal dreams and hopes in life. At the conclusion of this article I have some good news. But I would guess that some of you who are reading this are still walking along on a dark and difficult road and are not seeing your dreams fulfilled. I believe that Atteberry has some good advice for all of us. He offers three suggestions as to how we can keep our dreams alive. I believe that God is our Creator. He created each one of us to be uniquely different. Just look around and you will know that this is true. The Psalmist says that God knew us and was uniquely forming us from the time of our conception in our mother’s womb. (Psalm 139:13) And part of this unique individuality He created involves our personality, our interests, our desires, our hopes and our dreams. These are all a part of what makes us who we are. Accepting that as a given, we should also accept that we would naturally want to speak out about these interests and dreams that we have to other people. In fact, I believe that when a person truly discovers what dreams they have for life, they will feel so passionate about these dreams that they won’t be able to contain them and keep them secret. but will constantly be telling others about what they hope to accomplish in life. And that is as it should be. Sometimes we may not clearly know how to fulfill these dreams, but just by talking to others will help us to clarify the dreams and what steps we need to take to accomplish them. And don’t worry about negative or pessimistic people who for whatever reason are constantly shooting our ideas and dreams down. There will always be people like this around. Even if you are not seeing the realization of your dreams now, as Atteberry says, just talking about your dreams will help keep them alive. Not only should we be talking to others about our dreams, but we need to constantly be talking with God about our hopes and aspirations in life. Notice how I said we need to talk “with God”, not “to God”. Too often we make our plans and goals in life and then we ask God to bless all that we do. But in Proverbs 16:9 it says, “man plans his steps, but the Lord directs his path.” When we pray, it is important to talk over our hopes and plans with God, but it is even more important to be listening to the leading and guiding of the Holy Spirit. 3. Keep Moving Toward Your Dream. Now after all this good advice, there remains just one more thing to do: find out what you can do, even little things, and go out and keep pursuing your dreams. You may feel like it is hopeless, or that it will take forever to get to where you want. But remember the famous saying of, “How do you conquer the mountain?” Answer: “One step at a time. In a previous article I share how my one son waited and pursued after his desire to be in the Army. It seemed like every time he talked with the recruitment office they told him to fill out another application, or some new form. He could have given up. But he dutifully filled out each form. And he called back once or twice every week for a few months. And guess where he is now? After a two-year waiting period, right now he is in Quebec just about to finish the first month of his Army Boot Camp training. For me too it has been a long, slow process to get to where I am now today. Three years ago, I thought my missionary career was over when the full force of my muscle disease hit me. But in time, by some trial and error of different medications, and by continually adjusting my environment around me to make me comfortable, it has become possible for me to continue doing my Bible translation work. And so what about you? 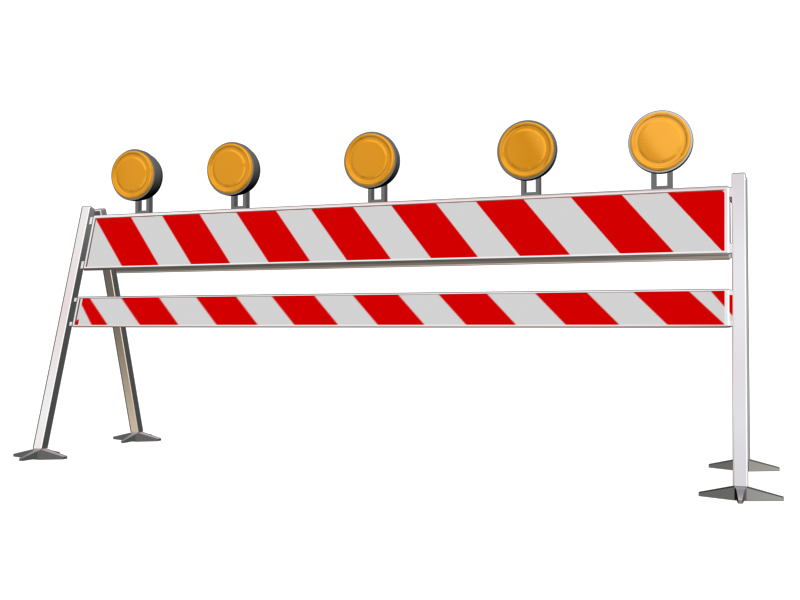 What obstacles are standing in your way. Jesus said metaphorically that even with tiny mustard seed faith we can conquer mountains that stand in our way. You have to believe first that your dreams and aspirations have come from God. Then believe that He can empower you to get to your goal. And then finally, we all just need to take a step forward and start walking towards our dreams. This is one of the opening paragraphs of Chapter 11 of Mark Atteberry’s book, “Walking with God on the Road You Never Wanted to Travel“. There have been many other chapters in this book that have contained great words of wisdom and advice, such as: travel along your hard road with good, trustworthy friends; expect detours but keep on walking; trust God, go at His pace and worship Him as you travel along. But this chapter seems to me to be written especially for me and my family. Let me explain. In a previous article, (“A Stricken Father“), I tell about the joy of finally becoming a Bible translator, and then experiencing the pain of watching my son suffer a major illness and being pulled out of our translation project in Papua New Guinea. Our story gets better as we were able to return to overseas mission work in 2006. We served with Pioneer Bible Translators for a year and a half in East Africa, but we didn’t quite capture the same level of joy and fulfillment that we had experienced in PNG. Before we left Africa in mid-2007, I had been in dialogue with a number of our PBT leaders in Canada, the United States, and also some of our overseas Branch Directors. As a result of these discussions, a very exciting picture of opportunities and possibilities begin to emerge. My Canadian Board and I talked about me helping to recruit, organize and expand PBT Canada. The Dallas office wanted me to come periodically to train new missionaries, just like the East Africa Branch wanted me to train national men and women to do Bible translation. The door to PNG opened up again as they invited me to come over and be trained to become a translation consultant and check Scriptures before they were published. This would open up the possibility of coming annually or semi-annually to PNG and work with many different translation projects. There was even one more fascinating role that the new President of PBT-US had asked me to consider doing, to act as the facilitator to help open a new country for field operations in South Asia. As the year 2008 began, it seemed to me that God had arranged all of the skills I had and the training and experiences that I had gone through, to put me in a place where I would be used by God as a Bible translator and linguist literally in countries and continents all over the world. Two months later though, in March 2008, the symptoms of my disease began to manifest themselves and in just six weeks I went from being a globe-trotting translator to not being able to walk across my living room floor. All my dreams and hopes of this promising future were shattered and almost died. Let me turn the focus off of me and turn it now on to my two sons. In these past few years, they too have had some of their own dreams and hopes, which up until recently were also seemingly being thwarted. My older son went to Bible college and was nurturing a dream of working with children and teenagers. He talked of possibly completing a degree and then working as a Youth Pastor. Unfortunately, he did not get a lot of encouragement from some people to pursue this dream,. But even more significantly, the post-cancer fatigue that he is experiencing is limiting him right now from working at any full-time job. My younger son, as you may have read from previous articles, had held for a long time the hope and dream of entering into the Canadian Army. He believed that he was meant to have a military life and career. It was offered to him in September 2009, but in a moment of doubt and not feeling ready at age 18 to be a soldier, he passed on the invitation. Upon more reflection for six months, he decided that the Army was for him, but positions were filled by then and for more than a year there wasn’t even any hope given to him that he would get another invitation. And so for three years, everyone in my immediate family (including my wife who has had her own dreams unrealized) has had to walk by faith and not by sight, trusting in God that He will one day bring our dreams to fruition. What helps us as Christians is that we believe these dreams of a more fulfilling future have been planted within us by God Himself who designed us to be this way. Atteberry is right in his introduction of this chapter as he recounts the life story of Caleb in the Bible in that his dreams were only deferred, pushed into the future, not defeated. Remember how Caleb had been one of the 12 spies who surveyed the land of Palestine, the land which flowed with milk and honey. But because of the sin of the people, it would be 40 years until Caleb was able to claim the promise of this portion of land. And so we will pick up this message in keeping your dreams alive in Part Two which will be published in two weeks from now.